I like food and I like motor cars. No wonder, then, that eventually I should visit Modena. This ancient and attractive city of arcades and palaces is famous for its balsamic vinegar and for its Ferrari sports cars. I will confess that I prefer the former, for on the only occasion I tried to enter one of the latter I found I had to be rescued – ‘extracted’ might be a better word – by those who realised that I was not one of those capable of the contortions necessary to fit into a Ferrari. (I decided to stick to Royces thereafter.) But Modena has another claim upon your attention. It has an impressive Romanesque cathedral with one of the most harmonious and atmospheric interiors to be found anywhere. I found it captivating and truly calming for the spirit. But where can one stay in Modena? I think I have the answer. Only a brief walk from the Duomo is the four-star Hotel Canalgrande. The highest rated hotel in the Old Town, it is on a wide but quiet street and occupies the site used in 1530 for the erection of a monastery. 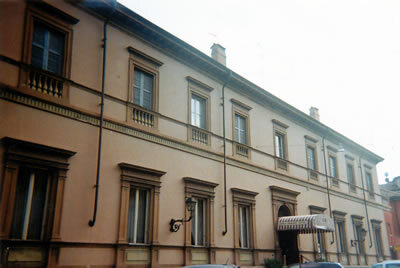 In the late 18th Century the religious departed and the architect Giuseppe Soli turned the building into the Palazzo Schedoni. 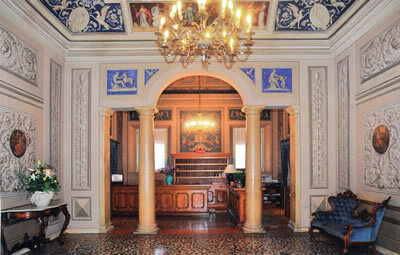 It is to Mr Soli that we owe the structure’s current appearance and its numerous touches of elegance. 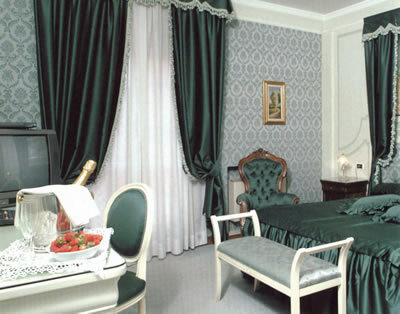 The hotel was born in the 1960s, but the graciousness of its public rooms create the atmosphere of a ‘mellowed’ palace. Indeed, the whole establishment speaks of the life and taste of an earlier time. The numerous oil paintings – many of them portraits – are from the 18th and 19th centuries. One modern thing which the hotel does possess, however, is its own garage – which is significant, for the city fathers are very protective of their home town and impose fierce restrictions on access and parking for motor cars. Another asset of the Canalgrande is a pleasant garden at the rear. I took the lift to the third floor, and found my room – number 342 – was at the front corner of the hotel. This meant that it had a substantial outside terrace, which wrapped itself around the angle of the building. 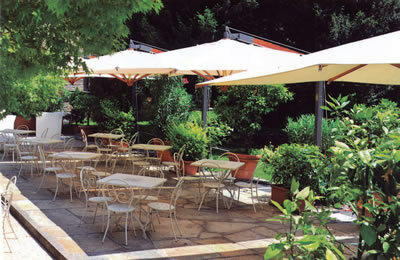 Sitting at the table provided was a pleasant al fresco activity, when I tired of gazing over the roof tops. From the corridor, I entered a tiny hall (with a fitted wardrobe) and then went through a door into the bedroom. This modestly sized chamber had walls covered with figured green silk. The curtains and the bedspread were of green satin silk, and the chair at the desk and the fauteuil were covered in green velvet. We might therefore call this ‘the Green Room’. Lighting was provided by crystal wall lights and the two bedside lights. Over the bed was a mural of a lakeside scene. Through a sliding door was the small tiled bathroom. Here I found a tub with a shower over, one wash basin, a bidet and the loo. I liked the provision of the many shelves for my numerous toiletries. There is a restaurant within the building, but it is under separate management and I did not try it. But I did, of course, go to the two breakfast rooms (one red and one cream) on the ground floor at the start of each day. Here I tucked into the food laid out on the buffet, and enjoyed the fruit (melon, plums and kiwi fruit), the croissants and the lovely bread, with strawberry jam. 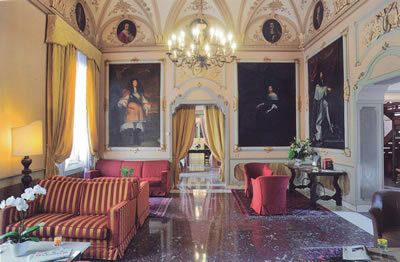 If you want to enjoy balsamic vinegar in the place in which it is made, or visit the Ferrari Museum, or recharge your spiritual batteries within the beautiful cathedral or even just wander the charming streets of Modena, the Hotel Canalgrande is a convenient and comfortable place to stay. Corso canalgrande 6, 41100 Modena, Italy.